We are Licensed and Certified Title V Inspectors. Are you getting ready to sell your Massachusetts home? Does your home rely on a septic system to treat your waste water? Did you know that you need to have a Title V inspection completed once every 2 years or once every 3 years if you can provide documentation that your septic system has been pumped on an annual basis. If you are putting your house up for sale you need to have a Title V inspection completed with a pass before the deal can close and title can change hands. It’s for these reasons that most homeowners shudder at hearing the words “Title V” and “Inspection” in the same sentence! Considering the cost to replace or install a new septic system, we don’t blame them! All septic systems within the state of Massachusetts, also sometimes known as subsurface sewage disposal systems, are strictly governed by Title V of the Massachusetts Environmental Code which is administered by the Massachusetts Department of Environmental Protection (DEP). 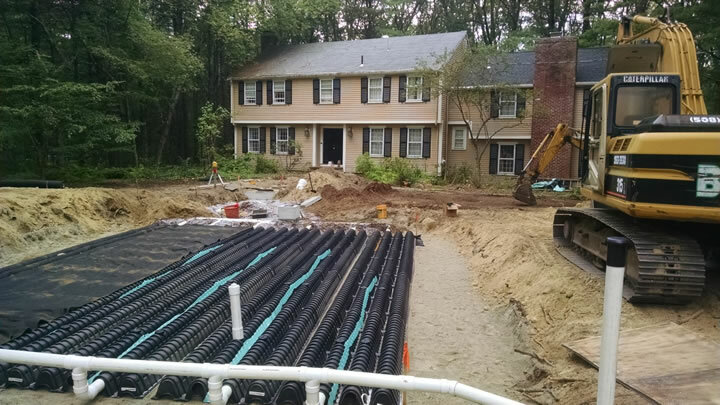 Bonica Excavation Inc. is an excavating contractor based out of Acton, MA with over 30 years experience in the septic system and residential waste water treatment industry. Our owner (John Bonica) is a licensed and certified title V inspector and he can complete a proper title V inspection on your septic system. We Rely On Septic To Treat Our Wastewater. Do we need a Title V inspection before we sell? This is a common question and the answer is Yes. You will need a passing grade on your septic system with the inspection being completed by a licensed inspector in the state of Massachusetts in order for your deal to close and the title eligible for transfer to the new owners. Depending on the condition of your system you can get a pass, a fail, or your system could “conditionally pass” which means your septic system will require repairs. Your title V inspector will be able to explain the specifics of your septic system condition. How Much Does A Title V Septic Inspection Cost? The average cost of a Title 5 Inspection can vary between inspectors but it’s usually somewhere between $500 to $800. The final price of your inspection will depend upon how accessible your system is and how much digging will be needed to locate the different components that make up your septic system. What Does A Conditional Pass Mean For My Septic System? If the inspector has given your septic system a “conditional pass” then it means that your system does have problems but is repairable and it will pass if certain conditions are met. There are several reasons a system might need to be repaired but one of the most common issues is that distribution box (d box) needs to be replaced, this is much less expensive than replacing or repairing the leaching field. When you’ve had the necessary repairs completed your local Board of Health will be able to issue a Certificate of Compliance which can then be accepted as a passing Title V inspection at the closing of your real estate transaction. What Do You If Your Septic System Fails The Inspection? This probably isn’t the news you’re going to want to hear. If your septic system fails the title V inspection then unfortunately your septic system must be repaired or replaced. If you aren’t selling the home and it’s remaining in the hands of the current owner on title you may have up to two years to complete the necessary repairs to the system. However, if your local Health Agent determines that your septic system failure is a health hazard, you could be required to begin the process of repairing your septic system right away. This can sometimes be the case if you are experiencing pooling of septic waste on your septic field or the run-off is going to contaminate storm drains and other private or public water sources. You’ll need to speak with your real estate agent to determine how to best handle your septic system repair or replacement for your real estate transaction as there are a few different options available to the homeowner in these situations. With 1/3 of all homes in Massachusetts relying on a septic system to treat their wastewater this is a common occurrence. Do You Have A Cesspool On Your Property? Will that pass Title V? What is a cesspool? Cesspools also known as leaching pools are pits dug into the ground that have concrete, brick or cement block walls. The system is designed so that wastewater flows into the cesspool and then drains or the industry term is “percolates” into the surrounding soil through perforated walls. Cesspools typically require more frequent maintenance than a traditional septic system. If you have a cesspool on your property you may be wondering how title V regulations apply to cesspools? What we can tell you is that cesspools aren’t as easy to get a pass in Massachusetts, this doesn’t mean they never pass. Only cesspools that are exhibiting tell-tale signs of hydraulic failure, or they are located extremely close to private or public water supplies, or otherwise pose a threat to public health, safety or the environment will need to be upgraded. Also, cesspools must be upgraded prior to an increase in flow, which could come as a result of an addition to your home with a bathroom or the development of a 2nd dwelling on your property. Why Choose Bonica Excavation Inc. For Your Title V Septic Inspection? John Bonica the owner of Bonica Excavation Inc. is a certified title V inspector. With over 30 years of experience in the septic and waste water treatment industry your septic system will be in good hands and you’ll get a good honest assessment of your system. If you’d like to schedule your title V or title 5 septic system inspection please call (978) 263-3530 or fill out our contact form and we’ll get right back to you.